Wowza! I cannot believe there is less than a month left of my undergrad here at UMD. It feels like it was just yesterday that I was a freshman moving into Griggs R and trying to find my way around campus. It is so amazing how fast time flies. I’ll be totally honest I wasn’t sure how college was going to go. I didn’t really like high school and feared college would be similar, so when mom left and I was all moved in I was pretty nervous. Sure enough though, I soon made some pretty great friends, knew how to ride the DTA, and landed a sweet job at Career & Internship Services. Do you all remember your tour at UMD before you were an official bulldog? I do and I remember the tour guide telling me the usual, “this is Solon Campus Center otherwise known as the Wedge, and there are some important offices…this one Career Services (before the name change) can help you build a resume and figure out what to do with your major…” at the time I didn’t give it another thought. But really, I wouldn’t be where I am today if I hadn’t had access to some of the resources they have available. In this post I am going to lay out what resources I used each year here as a student and map out my personal journey to figuring out what the heck I wanted to do with my life. I still remember my first appointment at C&IS, it was a week into the semester and I wanted to know what the heck I could do with a biology major. Not long after my first appointment I actually got a job working in the office at the front desk. As a requirement as a student employee, but also at the suggestion of the counselors, I took all three career assessments offered in the office, the Strong Interest Inventory, Myers-Briggs Type Indicator, and StrengthsQuest. Once I took the assessments and had the interpretations it was apparent that there was a pattern in my interests, strengths, and personality. At the top of the lists that include careers that match with your interests and personality was the career medical technologist. I had long thought about a career in the medical field but I really didn’t want to go to medical school. I am pretty introverted, meaning working with tons of different people and working weird long hours wasn’t all that appealing, but I did want to help people. Not too long after I had an advising appointment with my freshman advisor and mentioned that I heard about this medical technologist career and was interested and asked her if she knew much about it. She showed me a program at Mayo in Rochester that seemed really appealing. After a little research of my own on the career I looked at the pre-requisites and recommended courses for the program and decided that this was what I wanted. As my first year of college ended and the second was starting I continued to plan my classes around those needed and preferred for the Mayo Medical Laboratory Science Program. That year specifically I got interested in the idea of having an internship over the summer. I looked into a few on GoldPASS and perused the internet and ended up getting an internship as a graphic designer for Cross Media, LLC in Roseville, MN. The company is an innovative provider of mortgage-lending marketing tools and technology services that help mortgage banks, community banks, mortgage brokers, and credit unions connect to their customers, communicate more efficiently, and more effectively manage their relationships in a highly regulated environment. It wasn’t relevant to my biology major but I learned some very valuable and unique skills that some of my peers may not have. I learned how to use different adobe design programs and gained a lot of customer service experience. As I entered fifteenth grade, I mean my third year of college I was getting ready to actually apply for my program. I continued to take required courses, kept my GPA up, and fine-tuned my resume adding laboratory skills and relevant course work. I re-took the assessments to see how much had changed, a little anxious to see if medical technologist was still near the top, it was. That summer I took my first ever summer classes and used my networking skills to get myself a position job shadowing each of the departments in the St. Mary’s Pathology Lab (thanks to Joy at the volunteer services department at the hospital) and got to meet people doing what I hoped to be doing in the near future. I was nervous. What if I didn’t like it? What if the environment wasn’t for me? BUT, I felt right at home. I loved it there and was sad to leave at the end of the summer. The director wrote me a glowing recommendation for the application to the Mayo program, which was very much appreciated. Throughout the rest of the summer I worked on my personal essay for the application, making several appointments with the counselors who looked over the essay, checked for grammar, and helped me answer all the questions asked in 500 words or less. The time came in August when I actually had to apply for the program, it was amazing to think about those 3 years in the making and now it was time. After applying I made sure to write thank you cards to all my recommenders and kept my fingers crossed. So I applied, and I waited, and then I waited some more. Finally in December, 5 months after I applied I found out I got an interview. Immediately I set up several mock interviews to get prepared, I even set up a mock interview with multiple counselors to emulate the panel interview I was going to have to go through. The interview was during finals week so it was extra stressful but everything I learned from C&IS made me ready. Of course I was super nervous, it was my future we we’re talking about. And yes, I am not ashamed to admit that during the entire ride to the Mayo I was hyperventilating while my mom was driving. I sincerely thought I might vomit a little before the interview, but I didn’t, I held it together. The panel interview was a series of behavioral questions that I was allowed to see 15 minutes prior to the interview. The questions were all “describe a time when…”, so I needed to come up with 20 examples of why I am better than another candidate, which isn’t easy when you find it hard to talk about yourself. Luckily I knew my top 5 strengths, I knew my personality type, and knew my resume like the back of my hand. Through using all that knowledge, I weaved what I thought were unique and relevant examples to represent who I am and what I have accomplished. After the 3 hour interview and laboratory tours I was headed back to the Twin Cities and then back to Duluth so I could take my finals. Overall, I thought the interview went really well, and all that was left to do was to wait. In the mean time I sent personalized thank you cards to all the interviewers and started to work on plan B with the counselors, in the event I didn’t get into the program. They helped me find an alternative program, through UMTC, and reminded me that I can always re-apply for my program and work for a year. I looked up jobs in GoldPASS and found a few possibilities. Near the end of February I found out that I didn’t get into the program and that I was at the top of the waitlist. So there was still hope, but I was still devastated. Convinced my dream was slipping through my fingers I readied myself to start applying for jobs post-graduation. About a week or so before Spring Break, I found out that a spot became available and I was indeed in the program! The people at C&IS haven’t seen or heard the last of me. As soon as my program ends, I know I will be calling them up to help fine-tune my resume and brush up on my interviewing skills. I know I will have questions on salary negotiation and I’ll probably use GoldPASS to search for any job posting available for a medical technologist. In the end it all seems to be coming together, my career started out as just letters on paper, a mere idea, and now it is becoming a reality. I am Rochester bound and though I am sad to leave Duluth and Lake Superior, I am excited to start the next chapter of my life! This being my last blog post as an undergraduate I would like to leave you all with one of my favorite inspirational quotes. “All we have to decide is what to do with the time that is given us.” Gandalf put it quite eloquently and though the journey is your own, I want you all to know that you aren’t alone. College is hard, but don’t make harder than it has to be. My final pieces of advice for everyone are don’t be afraid to ask for help, figure out what you want to do and go for it, and lastly have fun. 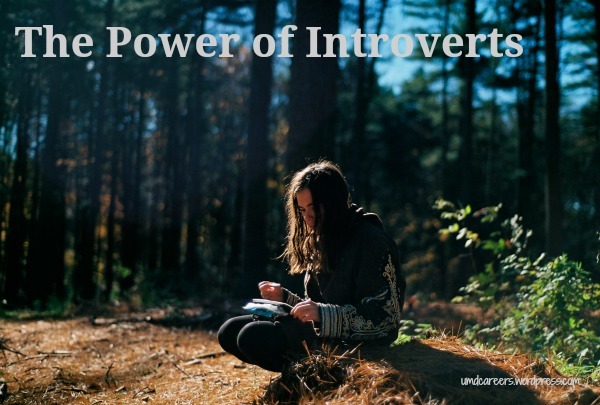 For this week’s blog post I chose to do a breakdown of Susan Cain’s TED Talk The Power of Introverts. Susan gave this passionate TED Talk back in February of 2012 and it is a must watch for everyone. Susan starts out the talk with a story about summer camp that she attended as a young girl. She talks about how she brought with her a suitcase full of books because in her family that is what they did together, it was considered a social activity. I have similar experiences with my mother, we would often read books together and discuss them, like a mini book club of sorts, and I too always brought books to summer camp. She continues by saying that they were encouraged to be outgoing, rowdy, and social at camp and that when she pulled out her books she was asked why she was being so mellow and it was implied that she wasn’t showing camp spirit. The message seemed to be that being quiet wasn’t the right way to go, that she needed to be more extroverted and so she put her books away for the summer and oddly enough she felt guilty about doing so. That message carried on into adulthood where she became a lawyer just to prove that she could be bold and assertive even though deep down she wanted to be a writer. Next she says something that I thought was really interesting; as many of you fellow introverts probably understand, we often put ourselves in situations that aren’t ideal, we go to crowded bars and hit up parties even though we would rather be at home or having a quiet dinner with friends, we do this to appease those around us and to seem “normal.” Susan says that this making of introverts into extroverts is not only a loss to ourselves but also a loss to the world. Introverts, like extroverts, respond optimally when they are in the right environment, different stimulations bring out different results. Where an extrovert shines in social situations, an introvert may require more freedom to work independently before revealing their ideas. But this need for freedom and solitude often gets the introvert’s idea passed over for someone more vocal, or extroverted. She then goes on to tell about how nowadays we have a bias for extroverts over introverts. This bias can be seen in classrooms and workplaces. Students now work in pods and perform copious amounts of group projects, even in subjects like math and creative writing. Often it has been observed that the ideal student is seen as an extrovert, whereas introverts can often be seen as troubled children. The open concept office has taken away the ability for alone time, which is crucial for introverts. She says this shift in favor of the “man of action” over the “man of contemplation” has to do with the change from an agricultural economy to a world of big business. You know the best talker isn’t necessarily the one with the best ideas. She says that there is a need for a better cultural balance between introverts and extroverts, we need collaboration but in order for us introverts to come up with our own unique solutions to problems we need more freedom to be ourselves. Often introverts feel guilty because they want to be alone, even though some of the greatest thinkers have needed to be alone and have done incredible things, but coupled with this solitude the collaborative piece will always be needed. Susan makes it very clear that she doesn’t hate extroverts. I too love extroverts as I live with a very vibrant one. I don’t think the point of the TED Talk is to shame extroverts. I think it is to tell the world what all us introverts are thinking. Let us do our thing and you will be astounded. Stop the madness for constant group work – I 100% agree with this one, I think that learning to work together is important but I also think it is just as important to learn to work independently. Go to the wilderness, unplug, and get inside your own head – this is fantastic. I think it is so easy to forget who we are these days with social media and the ability of anonymity on the internet, that it is healthy to get away from it all and get inside your own head. Have an epiphany like Susan talks about. Take a good look inside your own suitcase – use what is in it and open it up to others, the world needs you and what you carry. This is a wonderful statement because what is in your suitcase is who you are and who you are is nothing to be ashamed of. My suitcase would be filled with Tolkien novels, horror movies, and a subscription to Scientific American. My question to you is: what’s in your suitcase? Lastly, Susan sends everyone off by saying “I wish you the best of all possible journeys and the courage to speak softly” and I think that quote is beautiful. We live in a society that prizes outgoing and energized individuals and Susan makes a case for those of us who are quiet and contemplative. I encourage everyone to watch Susan Cain’s TED Talk because it is entertaining as well as informative. I think the most obviously benefit for Bilbo Baggins on saying yes to his adventure was that he ended up making off with a large sum of treasure but he also found friendship with many dwarves and elves of Rivendell. I think college is a once in a lifetime experience, these 4 or 5 years are years where we discover who we are and who we want to be and I think we often get caught up in the stress of it all and forget that now is the time to take chances and go on adventures. If you have the chance to study abroad do it, I didn’t and I think it could have been a blast even if it might have ended up adding on an extra semester, who knows maybe it wouldn’t have but what could hurt from going to the International Education Office (IEO) and inquiring about opportunities overseas? Go out and find an internship or volunteer, even if it doesn’t relate to your major, maybe you will find a new passion you didn’t even know you had. Throughout The Hobbit and the LOTR trilogy Frodo and Bilbo were helped out of troubling situations by their friends. Many times Gandalf saved the day, and without Samwise, Frodo would have never gotten the One Ring to Mount Doom. If I had not met my wonderful friends I would have probably ended up never exploring the city of Duluth the way I have and would have never made the memories I have over the years without them. Stay true to your friends and keep them close because you never know when you will need them or they will need you. Even though you might not get the first job, internship, or grad program you apply for that doesn’t mean you should cut your losses and give up. In The Return of the King at The Battle of the Black Gate Sauron’s army was defeated and the battle was won, but victory seemed hopeless and by the means of the destruction of the One Ring by Frodo, Middle-Earth was saved. The Fellowship never gave up and in the end they succeeded, but not without shedding a lot of blood, sweat, and tears. Figuring out what you want to do with your life and finding the right workplace for you isn’t meant to be a walk in the park, it takes perseverance, hard-work, and it means not being afraid to ask for help when you need it. Just like Legolas had his bow and arrow, Gimli had his axe, and Bilbo and Frodo both had Sting, you too need to learn how to defend yourself. I don’t mean to say you need to learn karate or go buy a sword; what I mean to say is that as an undergrad entering the work force the best weapon you have at your disposal is your resume. Being able to present your skills and experiences helps demonstrate to future employers what you have to offer. Making sure your resume is up to date before applying for jobs is just as import as checking your chainmail before you head off to battle. These are just a few of the lessons I learned from J.R.R. Tolkien’s novels that apply to my life as a college undergrad and soon to be college graduate. I hope this post was as inspiring as it was entertaining, I hope everyone is making new friends, defending themselves, and setting out on new adventures because that is what college is all about! You hear so much about internships, part-time jobs, and volunteering as ways to learn the skills you need to further yourself in the world of full-time employment after graduation. A less talked about option is that of the job shadow. You might be thinking that job shadowing is like bring your child to work day stuff, but it is so much more. Job shadowing helps provide the answers to the big questions like “can I see myself doing this as my career?” or “what does it really take to make it in this field?” It helps give a realistic view into all the things involved in the job you’re shadowing. You can observe the job characteristics, responsibilities, and environment and see how they match up with your personality and your ideals. You get to learn firsthand what it takes to make it in the field from the people who know it best, working professionals. I chose to write about this topic because I had the wonderful opportunity this past summer to job shadow in the St. Mary’s Pathology Lab. I gained insight and learned so much that I thought I would share my process of getting my position. My situation started out as a want to volunteer and grew into something so much better. As many students know, you can volunteer at St. Mary’s Medical Center to get some hands-on experience. This is why I went to their volunteer services and sat down with Joy Miller to discuss where in the hospital would be the most beneficial for me to volunteer. It became apparent, to Joy, early on in our discussion I wanted to work in a lab and that volunteering in the lab would be the best fit; unfortunately they didn’t have volunteer positions in the laboratory. I told Joy I would be content volunteering anywhere in the hospital but I expressed how amazing it would be to see the inner workings of the lab at St. Mary’s. Seeing how invaluable it would be to get experience in the lab Joy went out of her way to set up a meeting with the lab director and before I knew it I was job shadowing in each department of the lab over the course of the summer. I gained insight into the environment of the lab and I also got to experience the types of test that are run. I got to see the process of how the sample goes from patient to lab to doctor. It really enforced my dream of becoming a medical laboratory scientist. I also met and connected with some wonderful professionals in the healthcare field and even acquired a recommendation out of it that I think was essential to my acceptance into my post-certificate program at Mayo. As you can see, job shadowing has many perks alongside gaining experience. So now you may be wondering how you too can get involved in job shadowing. I think a key step in the job shadowing process is conducting an informational interview with the employer, like what I did with Joy. I think the informational interview is essential because it allows you to get to know the employers in a low stress atmosphere and build on your ever growing network of contacts who could help you get a job in the future. Of course in order to arrange an informational interview with a contact you need contacts and that is where networking comes into play. Ask your fellow peers about places where they have shadowed and networking events they’ve attended. 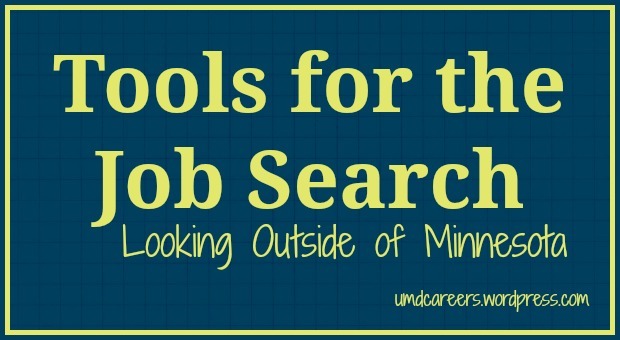 If you are interested in finding and setting up a job shadowing position I suggest setting up an appointment with a career counselor to discuss and explore your options and to look at our career handbook where there are helpful sections on both networking and informational interviews. There have been blog posts on graduate and professional school, but what other options are out there? I asked myself this question back when I was a freshman because I knew that graduate school was an option but not something I really felt was right for me. I remember going into my freshman advising appointment and talking with my advisor. She asked me what I was interested in and from the career assessments I took in the Career & Internship Services office I knew I was really interested in Medical Laboratory Science. I didn’t know much about the career but I knew it sounded promising. I did some research and found out that medical laboratory scientists are responsible for carrying out scientific testing on samples and reporting the results to physicians, and they get to work with state-of-the-art equipment to analyze a variety of biological specimens. It was the perfect mix of helping people, which I’ve always wanted to do, but didn’t involve direct patient care, which is something I knew I didn’t want to do. During that advising appointment my advisor told me about this post-baccalaureate program through the Mayo Clinic for students who have earned a bachelors degree in a biological science. It is a certification program where at the end of the 10.5 months students earn a certificate in medical laboratory science from Mayo Clinic. After graduating from the program, students are eligible for certification through the American Society for Clinical Pathology (ASCP) Board of Certification (BOC) and are credentialed as medical laboratory scientists. I was intrigued and excited at the possibility of getting into a program at the Mayo Clinic and being able to do something that seemed to align with everything I wanted to get out of a career, not to mention there was no test I had to take to apply (like the GRE or MCAT), which was a major bonus. Ever since that advising appointment I have been shaping my classes in accordance to the required and recommended courses listed for this program, I have kept my GPA above the required, and gained some first-hand experience in the lab of a hospital by volunteering in the Essentia Health-St. Mary’s pathology lab over this past summer. So the time came, 3 years in the making, I had to apply for the program. I wrote an essay on why I wanted to be a medical lab scientist, I got 3 recommendations, and submitted my application all the while keeping my fingers crossed in the hopes that I would get an interview. I applied in August. September and October went by and I had still heard no word, I was beginning to get discouraged. On October 29, almost 2 months later I received an email saying I was invited for an interview. All the planning and hard work paid off and now my future seems so much clearer. Of course you may be wondering why this matters to you or what it has to do with your options other than grad/professional school. Mine is just one example of the possibilities of education after undergrad. There are many certification programs out there, in many fields including human resources, business, education, and technology. Certificate programs are an effective way to expand your expertise in a specific area when the option to go to graduate or professional school is either not an option, not wanted, or not warranted. I suppose the overall take home message of this post is that graduate school is an option, professional school is an option, and certification programs are an option. There are so many options out there after you receive your undergraduate degree, and it is never too soon to explore all your options!